Satisfied with the reliability of Fives’ equipment previously experienced, Toll chose Fives as its solutions and technologies provider for the major new project. This project is the next major step by Toll to upgrade its freight sortation network, based on solutions delivered by Fives more than 10 years ago. The objective is to provide Toll with new cutting-edge technology solutions capable to meet the business growth and the high performance demand of the market. The equipment supplied by Fives comprises two cross-belt loops for a total length of 1,677m. The installation started in April as planned, before commissioning and test phase till final acceptance in late 2015. 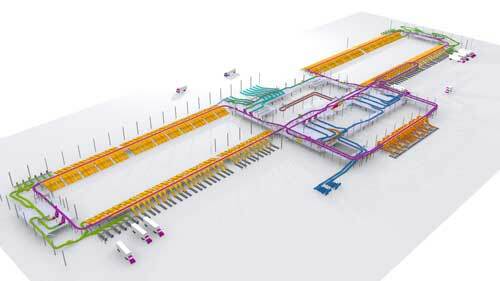 When completed, the system will provide Toll with a sorting capacity of up to 32,000pph to 368 destinations.